Oberweis Dairy has a new menu item. 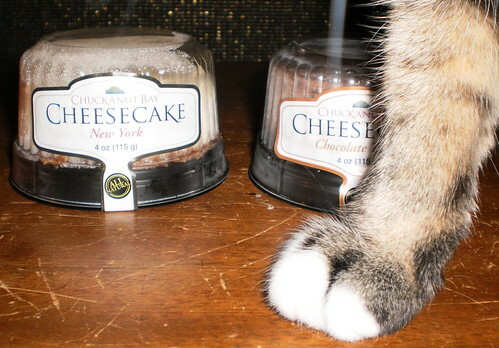 These cheesecakes are single serving and my photography "helper" gives you a relative size. They are cheesecake and so I had to try them. There are 6 flavors: New York and Chocolate Truffle, which I bought, and then Coconut, Mango Raspberry, Strawberry and Very Berry. They come frozen, in a palm-sized container that is recyclable and fairly easy to open. I started with the chocolate truffle. Well, duh. It took about an hour to thaw completely. The cake has a very creamy texture, as you expect from cheesecake. The chocolate tasted "dry", is the best way I can describe it. It was chocolate, but it didn't have the lasting chocolate mouth feel that I expect in a cheesecake. The crust was hard to cut through with a spoon, but that could be me and my arthritis. The New York-style was creamy and had good mouth feel. You expect a New York style cheesecake to have a somewhat delicate flavor since it's really just cream cheese, eggs and vanilla. This mini fit that bill. I could see the New York style served as dessert at a party where you have a variety of toppings. Again, I had problems cutting the crust but this could just be me. They are $2.99 each. I'm not sure if you can get them in the Oberweis stores. I'll try the Strawberry and Very Berry but not right now. These aren't in the budget and are definitely a splurge when I have a bit extra. If you are getting Oberweis home delivery and like cheesecake, start with the New York style and then go to the other flavors. They were a fun addition to the meals. It makes me want to make a full-sized cheesecake. I haven't had a home-made one in ages.